Environmental radiation exists in our environment from naturally occurring and manmade radiation sources. Often, environmental radiation is termed "background radiation." On average, Iowans receive an annual radiation dose of 300 millirem from natural radiation sources and 60 millirem from manmade radiation sources. Any one person's annual envrironmental radiation dose will vary depending upon their activities and location. The Earth itself is a source of terrestrial radiation. Radioactive materials (including uranium, thorium, and radium) exist naturally in soil and rock. Essentially all air contains radon, which is responsible for most of the dose that Americans receive each year from natural background sources. In addition, water contains small amounts of dissolved uranium and thorium, and all organic matter (both plant and animal) contains radioactive carbon and potassium. Some of these materials are ingested with food and water, while others (such as radon) are inhaled. The dose from terrestrial sources varies in different parts of the world, but locations with higher soil concentrations of uranium and thorium generally have higher doses. 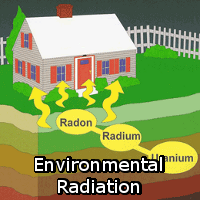 Radon gas contributes nearly two-thirds of our natural background radiation exposure. To a lesser degree, the public is also exposed to radiation from the nuclear fuel cycle, beginning with uranium mining and milling through the disposal of used (spent) fuel. In addition, the public receives minimal exposure from the transportation of radioactive materials and fallout from nuclear weapons testing and reactor accidents (such as Chernobyl).